This will be a short series of tutorials on performing some of the most basic of tasks related to DAZ Studio, created by adamr001 one of the Community Volunteers. While these methods have always worked for me, no two computers are ever identical and your results may not be the same as mine. Though, I sincerely hope they will be! 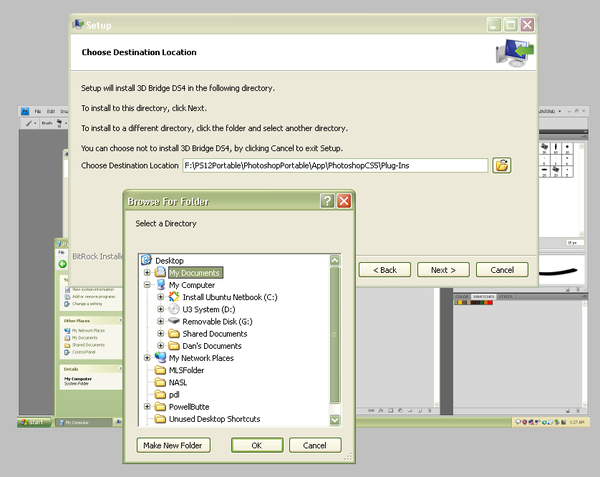 New to me, is presenting the tutorials with both Windows 7 and Mac OSX screenshots. Functionally they're identical, but some of the wording may change (e.g. Windows Explorer vs. Finder). Just click on the appropriate "edition" link... I should have the rest of this batch of tutorials done by tomorrow. Check back here on the first post. Standard vs Pro, 4.0 vs 4.5? I did a complete restore on my computer, all fresh and new. and I had downloaded the most recent version of 4.5 PRO. I entered the serial numbers for the registration. When I open the 4.5 it shows as 'standard'. Will this make a difference? Will everything still work properly? Do I need to put version 3 back in. Before the restore it was showing as 4.5 Pro with the two figures and the dragon in the opening box. Now it's the angel showing as just studio 4. Will it still function as pro??? If the DS Pro Plug-in Bundle has green plugs next to them, then you have Pro. If not, go to Help > Register DAZ Studio and put in your seral number again. I must update Daz 4.5 to last version, now here is the issue. Should i re-install also everything the contents ?? I noticed that when i map the folder of my content and re-import the DB there are always some issues, with icons or missing files or error messages like duplicate file exc..
Can someone tell me if i need to do a clean install to avoid errors etc..
"Installer payload initialization failed. This is likely due to an incomplete or corrupt downloaded file." I've already installed and started Daz 3d and it worked fine, except it didn't have any "essentials". So, I have one download left two downloads on my computer that don't work. What should I do? Delete the corrupt downloads, clear your Browser cache, and try again. If you don't clear the cache, you may always get the same corrupt download.. If you run out of download attempts, you can go to your Itemised Order History page, and Reset the item from there, that will give you more attempts. The Genesis Starter Essentials is quite a large file, around 350 MB, and it really is essential for using DAZ Studio. Okay, I'm pretty frustrated with this. So none of that worked. And it doesn't show up in my Itemized Order history. It has every time stopped downloading in the middle and then tries to open up the exe anyway. Why are the add ons/plugins not using the path I select while instead using a drive that isn't even on my computer to a photoshop version I don't have? What is not in your order history? Genesis Essentials? You have to reset DAZ Studio 4.5 Pro, then all the plugins and Genesis Starter Essentials will be there as well. t says on it, that if it is not the correct path, to change it. Do you have Photoshop? You do not need the GoZ plugin if you do not have ZBrush either. The Decimator plugin is not free, and if you previously bought it, then you should install it, but it needs a serial number. Have you managed to install Genesis Starter Essentials yet?
. It has every time stopped downloading in the middle and then tries to open up the exe anyway. The downloaded file should NEVER start to run itself. You have to run it, and usually as administrator. What operating system are you using, and where are you trying to install it to? Have you installed the main application (DS4.5 Pro), and if so where did you install it to? I tried to download essentials but again it didn't work. I don't know how to reset DAZ. I'll need some instruction on that. I've already installed the main program in "program files" which works fine. I have photoshop installed as well. So the bridge plugin would be nice. As far as the downloads, I accidentally clicked "always open these kinds of files" when selecting the download, so it pulls up the message box asking to either "run" or "cancel". But that happens well before I get to 200 megs which leads me to believe the download is disrupted each time. The installer doesn't start so I can't select a destination folder, but it would of been in "Program Files". If you log in to the My Account area at the top of the Forum, you will be taken to a page which has Itemized Order History as one of the options on the left hand side. The first thing to do, is to set the display to '50' items per page, and then find 'DAZ Studio 4.5 Pro', it is all in alphabetical order. It has an Order Number and Date, and at the very right hand side there is a link labeled 'Reset'. Click on that, and then all of the itmes will be put into your 'My Downloadable Products' page, usually with about 4 or 5 download attempts available. You can reset it another twice after that I believe, and then you may need email Support. I don;t know what Browser you are using, but you could maybe try another one, just to see if that is the problem? Always install content to the My Library folder, and not any folder beneath that. In other words, make sure that My Library is the last folder in the path that you give to the installer. Once we get the Essentials installed, we can work on the Photoshop Plugin. I'm sorry you are having so many problems, but I am sure we can iron them out. Let me know how you get on. Hi, I'm sorry, I'm sure this will have been covered before, but I've been unable to find the answer. How do I *completely* uninstall DS4.5? I previously had 4.0 and upgraded to 4.5 a few months ago, but neglected to add the Genesis content - which wasn't a problem as I always used Victoria and Michael anyways. Lately I decided to play with Genesis and found it wasn't there - checked the forums and followed the advice of installing it. Done, but content is still not found. No worries, I'd quite like to uninstall and re-install from scratch - it'll be a pain, but at least I'll be able to organise my content better as it got a bit messy with the way I installed 3rd party stuff. Uninstalled, re-downloaded, re-installed.......installed Genesis........and it's exactly the same. It's kept my content and still doesn't show any Genesis stuff. How can I completely clear it out to start again? Re-installing the program wont affect your content at all, nor should it. If your content is not appearing in DS 4.5, then there is something wrong, and reinstalling wont fix it in this case. A number of questions. What OS are you using? Where is your content installed to (the default is the My Library folder)? Where are you looking for your content? If you are looking in the Smart Content pane, then the CMS (Content Management Service) MUST be running. Content will always appear in the Content Library pane whether CMS is running or not. In Edit > Preferences > Content Library > Content Directory Manager, there should be a listing of the folders which are declared as DAZ Studio Formats and Poser Formats. It is important that these are listed correctly. If you are using windows, the CMS should appear in the Task Manager as ContentManagementServer.exe in the Processes tab with the 'Show Processes from all Users' box checked, and also in Services under DAZContentManagementService. See if it is running first. Thanks for the quick reply; unfortunately I had already done all of that as per found topics in the forums. As in my post, that's correct, it didn't affect the content; my issue being I wished to *clear* the content to start from scratch on the uninstall. However, I now appear to have resolved it by moving the studio folders out of My Documents into a temporary location and re-installing. It's done everything I need, Genesis has now installed ok and I can re-install my 3rd party content at leisure. I have just purchased Michaels Morphs++ (which I missed when they were free like Victoria's....... been waiting for the price to drop!) Which also weren't working due to something I did trying to fix Genesis - that's now installed ok too, so I'm a happy chappy! Again, Many thanks for the assistance offered. I'm having an issue with new items not showing up in daz3d. I've bought hair and clothes but they don't show in the program despite being in my library and in the same places with the other clothes/hair etc. The contentmanagement .exe is running. I can drag the clothes from the folders into daz3d as well as the hair but no materials show for them either. Can't change the hair colour which is pointless but the adjustments are available. Also a load of free stuff I downloaded and installed hasn't shown up either even though in the installed items folder they're all present. Victoria5 has shown up no problem though. What's wrong with the rest of the items? I've installed them using recommended and specified paths but still no difference..
Where are you looking? If you arre looking in Smart Content, only items that have Metadata associated with them will show up there. Have you tried the Content Library pane? If these are Poser items, you will need to go to Poser Formats > My Library > Figures to see them. If hair colours are not showing in the vieport, are you sure you have your viewport set to 'Texture Shaded' ? Ahh! I get it now. It helped that I also just watched that video lesson that's been staring at me but you got me thinking. So if it doesn't have a metadata install it can only be found on the right contents pane. Yeah I have all the hair materials with nice pictures staring at me now. Good stuff. I didn't spot an answer to this anywhere but I'm sorry if it has been asked and answered already. I'm thinking of options for a new computer and, since I have a MacBook I might opt for an iMac. If I do, I'll probably install Windows 7 via Bootcamp too. So my question is this: is it possible to share the Daz Studio content library between the two operating systems? For example, if I have the Mac version of DS4.5 running - can it use the content installed for the Windows version? Why have Windows at all? There are some things I have already licensed on my Windows PC that I would prefer not to have to buy again for Mac (and probably some that have no Mac equivalent). Sure! I used to have my content directories shared between Windows 7 and OS X Lion. This arrangement always worked very fine. After upgrade my Mac Pro to Mountain Lion I give up Bootcamp and installed Parallels Desktop to run Windows eventually. I really don't need Windows for nothing actually, only to run some small utilities as Texture Converter or something like that which don't need CPU running at full power. Buy an iMac and be happy! Yes, the only real issue you'll have is keeping your CMS Database sync'd up. But from a content perspective there's no reason why it won't work. The reason I thought it might be a problem is because DAZ provide separate installers for MAC and PC and I wondered whether the files they installed were operating system dependent. Where did you install Genesis Starter Essentials? Was it with installer, DIM, or manually extracting the DIM zip? For Generation 4 morph packs you need to install them to the same location as the V4/M4/K4 base. If you're using one of the old installers, don't choose Poser as the target application unless your version of Poser is older than P7sr3. There shouldn't be a folder named "Content" underneath "My Library" -- move everything underneath that "Content" folder up one level to merge with the corresponding folders under "My Library". Hi .. New to Daz (and pretty much every other program I have purchased) Just found this thread .... Wow ... Thank you! I just downloaded DAZ Studio onto my laptop. I bought this laptop from a vendor who assured me that it met or exceeded the minimum system requirements. We went opver the requirements together in person. My laptop will not run the tutorials. It will not run the first tutorial and because of that it does not seem to want to run any of the subsiquent tutorials either. It hangs up while loading content. 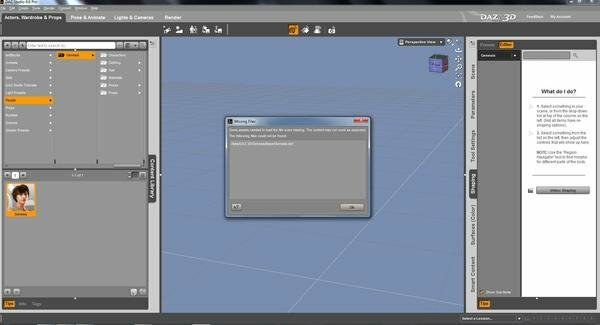 The tutorial REQUIRES THE STUDENT to select Iray for the preveiw window. As close as I can tell this hangs up the program because my laptop does not have an Nvidia GPU. It does have Open GL but the graphics card is not replaceable. What were you thinking? How am I supposed run the tutorial on a barely > minimum system? It is an i3, 4GB RAM, 500GB HD.